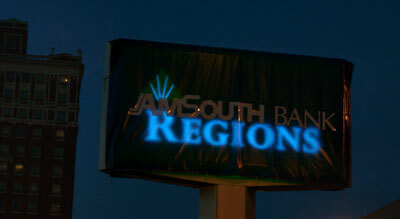 The AmSouth to Regions conversion was visually completed this morning with area banking centers switching from the familiar blue and white to the new Regions green. As we reported in May, the complete changeover should be complete by October. The name change affects not only the banking centers, but also civic centers named for the now absorbed AmSouth. Harbert Realty Services announced today that Harbert Plaza would officially change its name to Regions Harbert Plaza to coincide with the merger. Signs had been replaced on the 32-story building in downtown Birmingham months ago, but there had not been a formal announcement until today. Harry Lynch, president and CEO of Harbert Realty Services said, "The name change of our building will not affect the high level of service that our tenants expect.” The building’s tenants currently include Regions Bank, Balch & Bingham LLP, The Summit Club and Ernst & Young LLP.